It’s when I’m alone, often driving, that the realisation of my rugby journey kicks in. 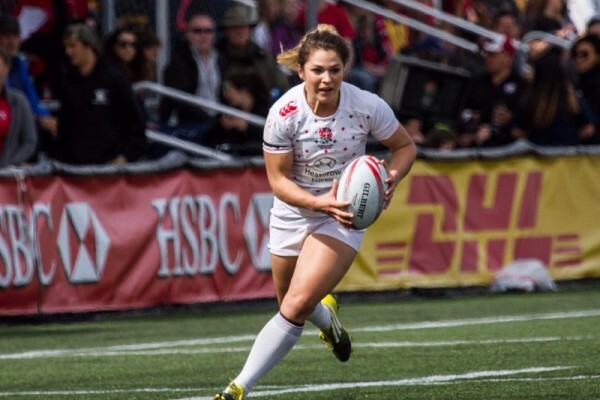 In the last three years, I became a Red Rose, one of the first professional female rugby players in England and I have been to an Olympic Games. I smile to myself as the true enormity of it all sinks in. Rugby came about for me by chance, when I was eagerly encouraged by one of my school friends to go to a taster session at Worthing Rugby Club when I was 11 years old. Due to the number of girls playing then, I played my first game for the U17 team at 11. Even I, tallest in my year at the time, seemed extremely small, which was emphasised by my shirt that completely engulfed me. It was when I was selected for the England Women Talent Development Group (TDG), which at the time comprised a group of players that had the ability to become England U20 players, that I got the hunger to push for my Red Rose. It gave me a confidence boost and awareness of what it would take, along with the motivation to reach the top. Tenacity, grit, competitiveness and an ability to come back stronger from any obstacle are a prerequisite. There is not one player who has represented England who has had a smooth journey. It gives you character, drive and a huge sense of achievement by overcoming setbacks. You can be physically the best athlete in the world, but without the mental strength it means nothing. You have to want it more than anything. The thought of pulling on my first England jersey, sprinting out onto the pitch and belting out the anthem without letting my emotions takeover, that still sends shivers down my spine. I think of the calibre of players who have proudly worn the Rose on their chest and I feel part of an exclusive group. That Red Rose represents everything we have all worked for: the early mornings and late nights, where the only option is to fit in training around work and studying – for me, achieving an engineering degree. Burning the candle at both ends repeatedly, because that is what it takes to be part of the team. Now, I am among a privileged group of players who get paid for doing what we love. Although there are definitely still the early mornings, our bodies now get a chance to recover. I have complete and utter respect for the champions who throughout their whole England playing career did it tirelessly and solely for the love of the game. They inspire me to remember every morning when I wake up why I am pushing to be the best I can. It will never be about earning money, it will always be about representing England. The Olympic Games taught me that it’s okay to show emotion. For someone who doesn’t give a lot away in other aspects of life, it is rugby that sends me on the biggest roller coaster of highs and lows. The tears shed after our last game in Rio 2016 tell my story. They show how much that one moment meant, how disappointed I was that we had not delivered what we set out to do; that we didn’t win that medal. But ultimately it has given me the appetite to get back and fight again. There is a World Cup to retain in 2017 and what better way is there to react to defeat?